If you are a DJ then of course you need the perfect t-shirt to promote yourself. And this t-shirt does exactly that. It shows a pair of headphones and in between it says “DJ” and below on the wire this t-shirt says “your name” but when you order it it will have the name you want on it (no extra cost) so that this can be a great shirt to wear to your next gig. And this DJ t-shirt is an American Apparel t-shirt that comes in adults sizes XSmall – 3XL. And when you are doing your DJ act you want to be comfortable to so that is why t-shirt is made from 100% cotton. 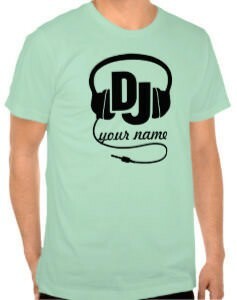 Get your brand out by wearing this Personalized DJ T-Shirt.